Indulge in Wine and Chocolate Because You Can. Much of the country is paralyzed under umpteen feet of snow. Here in the Pacific Northwest, we should celebrate our ability to travel freely by, well, traveling. The upcoming Red Wine and Chocolate Festival at our Washington State Wineries is a great incentive to travel to the Olympic Peninsula the weekends of February 12 and 13, and 19, 20, and 21. Picture a towering fountain of flowing chocolate and barrels of delicious Washington State Wine. Why stay at home when you can experience that? Wine and chocolate may not be inherently romantic, but they can be a lovely addition to a romantic moment. In honor of Valentine’s Day, enjoy a romantic getaway on the Olympic Peninsula – in Port Angeles, Sequim, or Port Townsend. Visit our Olympic Peninsula Wineries to sample a variety of Washington State Wines and a delicious array of chocolate creations. Savor Merlot-infused chocolate truffles by Linda Moates of Coca d’Amici at Camaraderie Cellars in Port Angeles, where you’ll also find slow-roasted pork rubbed with cocoa and a pre-release 2008 Syrah. Drink from the tallest chocolate fountain in Washington State at FairWinds Winery in Port Townsend, where new releases of their Lemberger and Cabernet/Merlot will be poured along with eight other varietals. Relish the flavor of regionally grown fruit at Finnriver Farm & Cidery in Chimacum. Sip Spirited Apple Wine, Black Currant Wine with Apple Brandy, and Blueberry Wine with Apple Brandy, and indulge in “Sprited Apple Chocolate Fudge” by Chocolatier Lynn Hamlin-LeMaster of the Port Townsend Chocolate Company. Take advantage of the fact that we in the Pacific Northwest don’t need to shovel our way out of our driveways in order to travel. Head to the Red Wine and Chocolate Festival on the Olympic Peninsula the weekends of February 12 and 13, and 19, 20, and 21, 2011. Celebrate Valentine’s Day by indulging in pleasure. 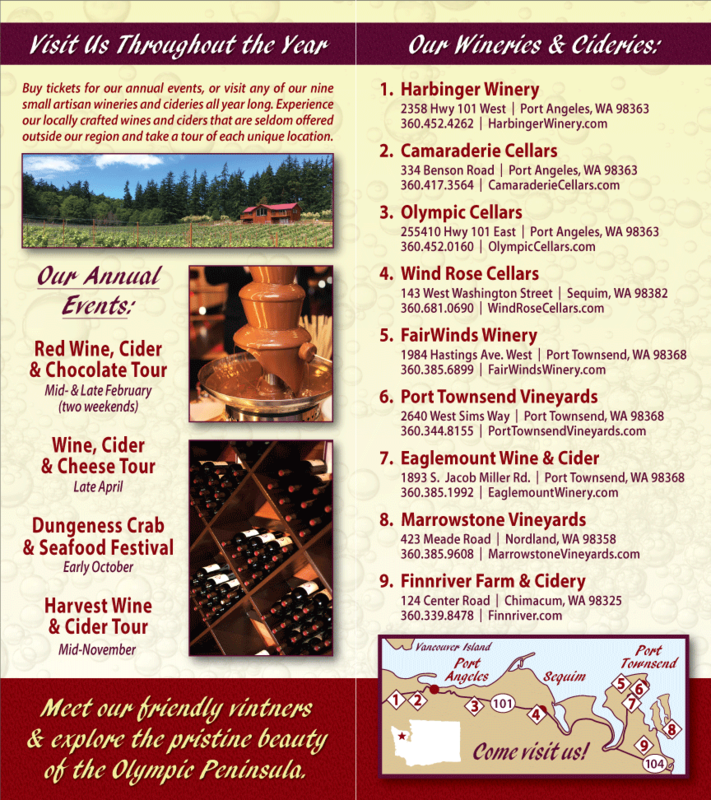 Additional festival details are available at Olympic Peninsula Wineries Events.